Colorado lost the largest number of people to suicide in state history last year —1,058 — and the state once again ranks among the worst in the U.S. for high suicide rates. Suicide kills more Coloradans each year than homicide, car crashes, diabetes, breast cancer, flu or pneumonia, according to state health officials. Health experts say guns are too easily accessible for people who are depressed. They also blame Colorado’s extremely high suicide rate on inadequate mental health systems and a lack of funding for prevention programs. Like other states in the Rocky Mountain West, Colorado consistently tops the list of states struggling with suicide. Colorado ranked seventh in the nation for suicides in 2013, the most recent year for which national data are available. That year, Colorado tied with Idaho. Topping the list were Montana, Alaska, Wyoming, New Mexico, Utah and Nevada. Jarrod Hindman, manager of suicide prevention programs for the Colorado Department of Public Health and Environment, said the primary theories for why mountainous Alaska and states in the Rocky Mountain region year after year rank high for suicides center on attitude and altitude. “In the western U.S., particularly the Rocky Mountain region, we have a great deal of rural geography. One of the issues is the lack of access to available mental health resources. There’s also that notion of rugged individualism. When you’re struggling or need support, you don’t ask for help. You want to pick yourself up by your bootstraps, but your brain won’t allow you to do that,” Hindman said. Colorado established a new suicide prevention commission in 2014 and public health officials are partnering with hospitals and gun shop owners to try to foster better awareness about suicide risk. But, prevention programs are expensive and a dramatic reduction in suicide rates will require a comprehensive approach like the concerted efforts to drive down automobile death rates. “With cars, everybody knows about the danger of motor vehicles. You know if you drive drunk, there are serious consequences. They know about seatbelt laws. Cars have airbags and are much safer. With a good amount of money and marketing, we’ve seen reductions in the motor vehicle death rate,” Hindman said. With respect to cutting suicide rates, “It will most certainly take will and both human capital and financial capital,” Hindman said. Unfortunately, Hindman points out that there is not one key factor or device like an airbag that can help prevent suicides. Depression is complex and in many parts of rural Colorado, guns are commonplace. Excerpt from a brochure that gun and pawn shops and shooting ranges are sharing with customers in western Colorado. Courtesy of the Office of Suicide Prevention at the Colorado Department of Public Health and Environment. To try to keep guns away from people who may be suicidal, health experts are partnering with gun and pawn shop owners, firing ranges and advocates for firearm safety. Colorado last year piloted a program modeled after a New Hampshire education effort that works with hospitals and gun retailers to try to keep guns away from people who are depressed. 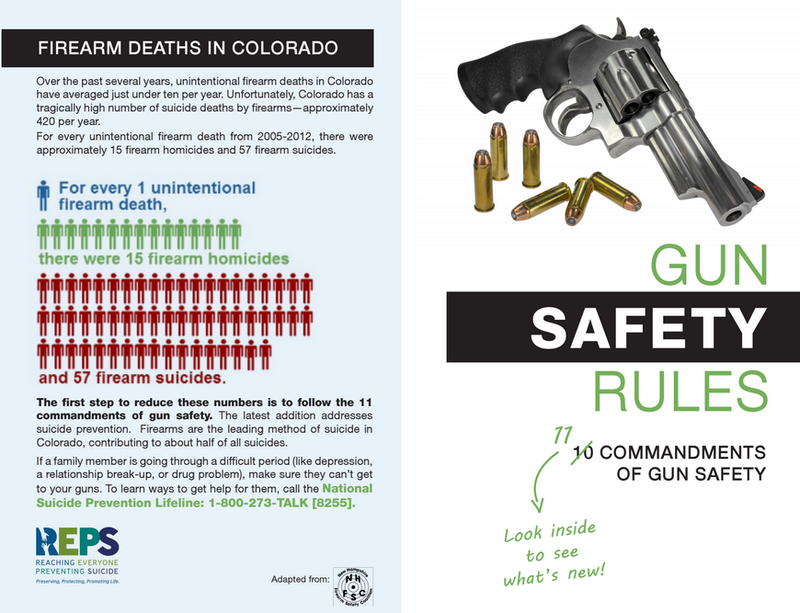 Through the program, gun advocates distributed information about the “11th Commandment” of gun ownership: temporary off-site storage of guns if a family member is suicidal. Suicide prevention experts are also piloting a program with hospitals to be sure people who have come to an ER for suicidal thoughts have a place to call for help when they’ve been released. So far, Denver Health, Presbyterian/St. Luke’s Medical Center, St. Mary’s in Grand Junction and a group of hospitals in southeastern Colorado have signed on to pilot a new effort to make sure all at-risk patients or their family members go home with an appointment for follow-up talks with suicide experts through the state’s phone crisis line called Rocky Mountain Crisis Partners. “We’ve got all these really great ideas and programs started. If they are effective, we’re hoping to expand them as quickly and efficiently as we can,” Hindman said. But that takes money. The new hospital effort, alone, is costing $42,000 a year. And with that amount of money, the state is reaching just a handful of the state’s 88 hospitals with emergency departments. Suicide prevention help is available 24/7 at the Suicide Prevention Lifeline at 1-800-273-TALK (8255) or the Colorado Crisis and Support Line at 1-844-493-TALK (8255).